This short-lived town waited for a railroad that never arrived. 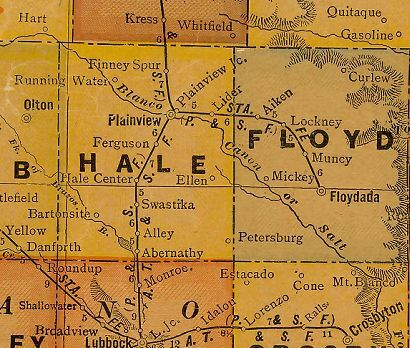 In 1907 the town was laid out in anticipation of a Santa Fe extention from Plainview to Lubbock. The would-be town was on land donated by the Barton Ranch. Although it accumulated about 250 people and had a post office granted, when the proposed route was cancelled people drifted away and buildings were said to have been moved to Abernathy. A few people held out until 1921 when the post office closed its doors.